Vancouver Fire and Rescue Services (“VF&RS”) has a long tradition of being represented at civic and departmental events by a band. From 1927 to 1994 the Vancouver Firefighters’ Band was an integral part of VF&RS. In 1994 the Vancouver Firefighters’ Band Society (the “Society”) was created and the City was affiliated with and represented by the Society from its inception in 1994 until August 2009, maintaining the name Vancouver Firefighters’ Band. The City and VF&RS are no longer affiliated with the Society. The Vancouver Firefighters’ Band, also known as the Metro Vancouver Firefighters’ Band, no longer represents the City or VF&RS. As the City and VF&RS no longer wish to be associated with the Society, we will decline to be involved in any event which involves the Society, also known as the Metro Vancouver Firefighters’ Band. 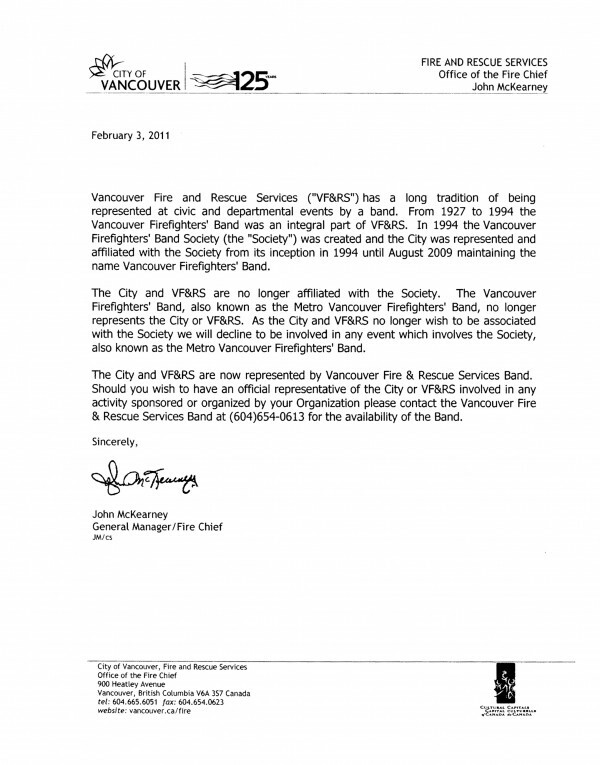 The City and VF&RS are now represented by the Vancouver Fire & Rescue Services Band. Should you wish to have an official representative of the City or VF&RS involved in any activity sponsored or organized by your Organization, please contact the Vancouver Fire & Rescue Services Band at (604) 654-0613 for the availability of the VF&RS Band. NOTE: The band no longer affiliated with Vancouver Fire and Rescue Services also uses the following names: Vancouver Firefighters Concert and Marching Band Society; and Metro Vancouver Firefighters Band (sometimes appending “Society”). The band affiliated with Vancouver Fire and Rescue Services since 2009 is now called the Vancouver Fire and Rescue Services Band; this band is a continuation of the original band, founded in 1927, and is overseen directly by the Fire Chief. The report identifies the wrong band: David Waterhouse and Jason Davidson have never been part of the Vancouver Fire and Rescue Services Band. The caption in the photo is incorrect, too. That photo is of the Society band, not us. The two bands are completely separate entities. Only the Fire Chief or his designate, not David Waterhouse who is not affiliated with our band in any way, speaks for our band, the Vancouver Fire and Rescue Services Band. Many thanks to the CBC for correcting their article so quickly. It now identifies the correct band, not us.